On the day Michael was part of a panel of academic experts and humanitarian and human rights practitioners discussing Casement’s legacy to modern Irish international relations. Writing in 1914 Casement dreamed of a time ‘when Irishmen preached not freedom for themselves alone but freedom for all others.’ This was the international line followed by Ireland after independence, at the League of Nations from 1923 to 1946 and since 1955 at the United Nations. Fittingly, DIFP’s UN60 exhibition, which Kate and Michael curated through 2015, was on display at Baldonnell during the day long event. 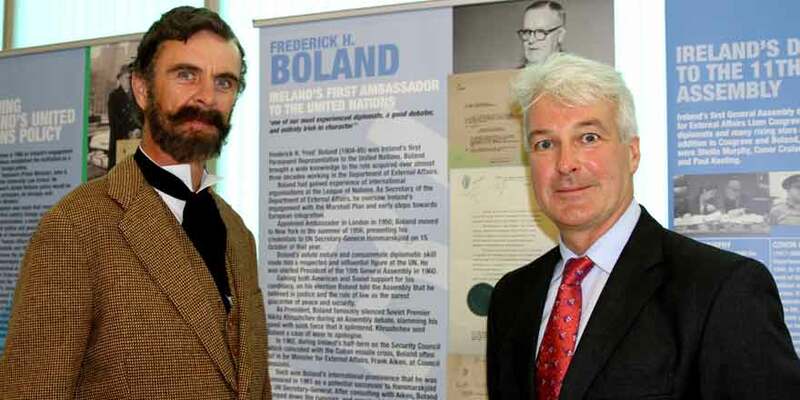 From the perspective of the history of Irish foreign policy and Irish diplomatic history it is no exaggeration to say that Roger Casement is in so many ways the founding father of Ireland’s diplomacy and that so many of his ideals are present in the signature stances of 21st century Irish foreign policy. Photo caption: Actor Declan McCarth with Michael, gave a moving delivery of Casement’s speech from the dock, to the capacity crowd at Baldonnell.